Where did I find those words? A tea bag? Fortune cookie? A friend? Maybe it was in a story I wrote? Something I read? I don’t know that it matters. In my heart, I’ve connected the phrase with this week’s word: Sagacious. The word reminds me of the amber color and stickiness of honey; the syllables coat the tongue while crackling with intention. 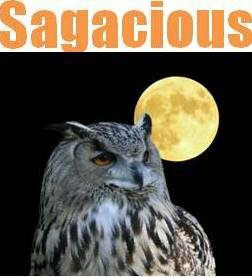 “Sagacious” just sounds like something I want to be! The word speaks to the power of discernment. Good judgment. Hmm. Wisdom. Um, right. Common sense and being able to see “what is.” Whew. Carefully observing before acting. According to Merriam-Webster and other sources, a sagacious person is associated with many lofty attributes: far-sightedness; acute insight; wise decision-making, good judgment. A sagacious person is adept in managing the winds of change because he or she is an expert in reading the social, familial, or political signs of the road. I still have on my travelin’ shoes. I was looking for someone to throw down the gauntlet in my name, and the leaves did not or could not point out my poor judgment. I am passionate about tea. A visiting friend once brought me a box of tea. The round container with delicate pastel drawings was filled with one of my favorite mixtures, hibiscus and rosehips. The tea bled red as blood into hot water. The heat from the cup was like the love I felt for the man I was seeing. The taste was as healing as the feeling of protection I had in his presence. I once looked for discernment in tea leaves. The magic of tea is seductive. Tea warms the body on a cold day, sweetens the mouth, brightens the eye, and feeds the soul. Oh. Like being in love? cup of jasmine flavored liquid this way and that. Finally, the swirling leaves settled in the bottom of the vessel. She set the cup before me. The leaves did not tell me the man was deceptive. The leaves warned of, but did not point out, my poor judge of character. The man could not throw down the gauntlet on my behalf, and I was forced to draw on something inside: wisdom and trust in the future—part of the recipe for becoming a sagacious person. One does not become sagacious by reading about it. Some of the learning comes from parents; some from great educators or great spiritual masters. But truly, doesn’t becoming sagacious come from walking and listening, observing, and seeing what is? Darn. Some people seem to get it right every time. I’ve still got on my travelin’ shoes.